Cast iron is heavy, hard-wearing and suitable for all kinds of heat and heat sources. It is perfect for the oven and for very high heat on the stove. Cast iron is a versatile material, compatible with all cooktops including induction (though you want to be careful on delicate glass stove tops). It’s one of the most durable cookware materials you can find, and many brands jazz their cast iron with bold colors. Many cast iron cookware sets are coated with enamel (hence the color) for a scratch-free, semi non-stick finish. Others are left raw and rustic and in need of seasoning. There are some fantastic brands who offer high-quality cast iron with eye-catching colors and a wide variety of items to kit-out any kitchen. 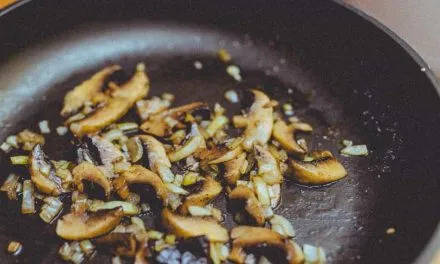 We’ve found the best cast iron cookware sets for you to pore over and pick the best for you and your cooking adventures. 14.1 Are cast iron skillets oven safe? 14.2 Can cast iron cookware be used on glass top stoves? 14.3 Are cast iron skillets dishwasher safe? 14.4 Why do cast iron skillets rust? 14.5 Is enameled cast iron cookware safe? Le Creuset is one of the most trusted, well-respected brands when it comes to cast iron cookware. 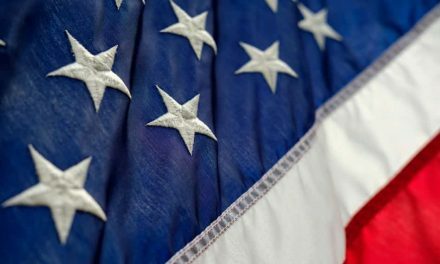 Their bold colors and hard-wearing materials have made their mark for many decades. This comprehensive set offers 14 pieces, enough to overhaul your current cookware collection. As we see, this set has a mixture of cast iron and stoneware items. We love this feature, as it offers different benefits and aesthetic finishes. Stoneware is great for slow baking or roasting, and it’s completely scratch-free and durable. It’s oven, microwave and freezer safe and is semi non-stick. A stoneware rectangular dish is a staple in any kitchen (for roasts, veggie dishes, fish dishes, baking etc.) so it’s a very welcome feature of this set. The cast-iron skillet is awesome as it can be used on the stove and oven, at high heat. 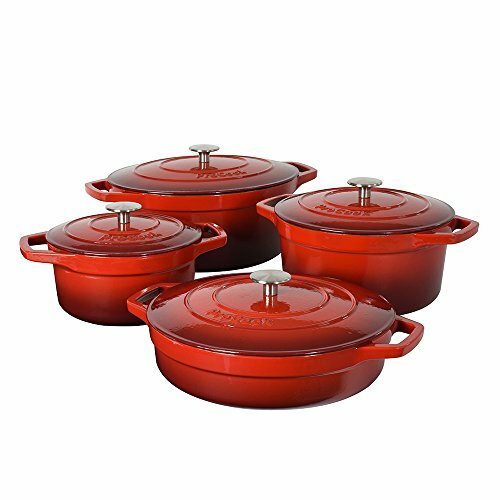 The round dutch oven and the saucepan are both coated with enamel for a scratch-free performance. The red shade is rich, deep and perfectly offset with black lid knobs for contrast. The four utensils (3 spatulas and a basting brush) are all made from silicone, with wood handles. They’re all heat-resistant and dishwasher safe. This is a great touch, as high-quality utensils are always much appreciated in any busy home kitchen. The included cookbook is always a great bonus too, as it gives ideas specific to the cookware. 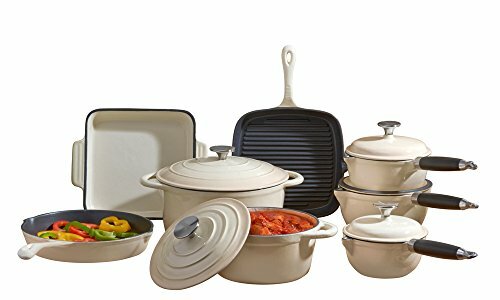 This is a very high-price cookware set which offers a thorough range of cookware items to cover most cooking jobs (roasting, searing, slow-roasting, baking, boiling). We love that you get two great cookware materials, (enameled cast iron and stoneware), as well as high-quality utensils and a cookbook thrown in there too. If your budget can accommodate the cost, and you’re looking for oven-safe cookware to really last, this is absolutely a good choice. Even more so if you’re looking for bright colors to give life to your kitchen. Here we have a heavy-duty, rustic cast iron set designed for cooking outdoors on an open fire. Made from pre-fired cast iron, these pieces are ready to use out of the box. A thick, heavy, no-nonsense set has no bells and whistles or colors, it’s a true cowboy-style set. The thick cast iron is invincible and can handle being immersed into a fire with all-around heat. No coatings or enamels to crack. We love the addition of the lid lifter as it makes for easy usage when out in the bush or at the campsite. You can lift the lid from afar without getting burnt by the fire. Open fires do tend to be uneven in heat, but the thick, heavy cast iron helps to distribute the heat evenly throughout the cookware to get an even result. You’ll need to keep these seasoned to prevent rusting, but that’s standard for cast iron. I don’t see why you couldn’t use the skillet or griddle on your indoor stove, but you’d want to be extremely careful on glass or ceramic stovetops as the rough, heavy cast iron could easily scratch the surface. 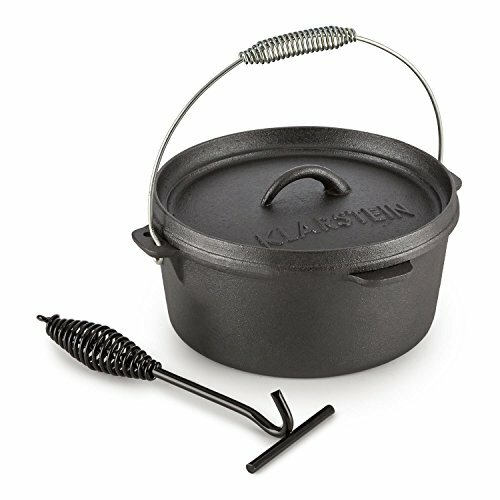 Always keep an iron in the fire: with the Klarstein Hotrod Masterplan Dutch oven set , cook just like the cowboys in the Wild West used to. Get back to nature and enjoy the simplicity! With the Klarstein Hotrod Masterplan BBQ set , you have everything you need for cooking on an open flame. Discover original cooking methods anew and go back to the basics: whether roasting, baking or cooking, the cast iron Dutch oven will inspire you. This is the perfect cast iron set for anyone who regularly cooks outdoors. 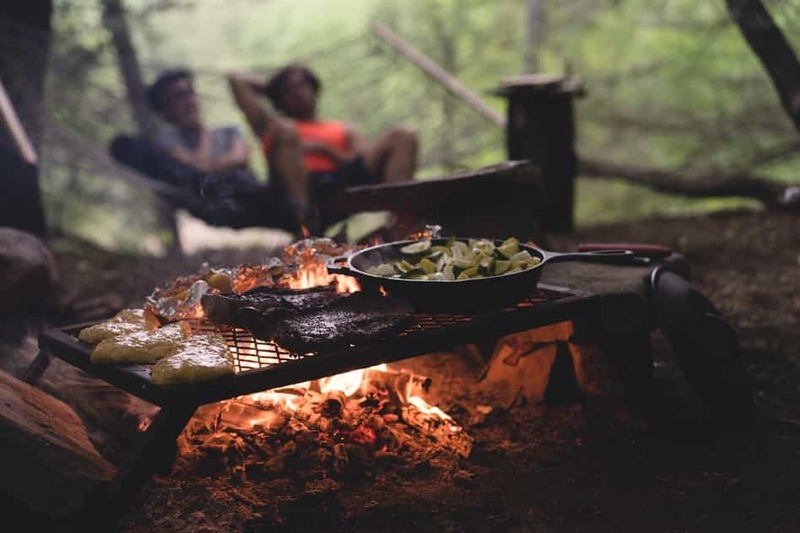 Perhaps you’re a regular camper or you have an outdoor fire oven at home. You can make anything with this set; grill meats, simmer stews slowly, boil potatoes, fry fish etc. Considering what you get, and the quality of the materials and design, the price is pretty darn great. Once you’ve finished using it, pack it away in the wooden box until your next outdoor, open fire cooking adventure. This is an enameled cast iron set by VonShef, with a red outer and a creamy sand colored interior. The great thing about these pans and pots is that you don’t need to season them, as the cast iron has been coated with enamel. 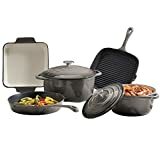 The three cookware pieces in this set are handy for everyday meat and veggie cooking, including casseroles, veggie bakes, grilled fish, meat and steak, soups and curries (among others). The lid which comes with the casserole pot sits tightly on the pot and is designed to hold moisture in the pot. This helps to create a juicy, moist environment for slow-cooked meats and casseroles. The gratin dish is always a great addition to a cookware set, as many sets don’t feature them. 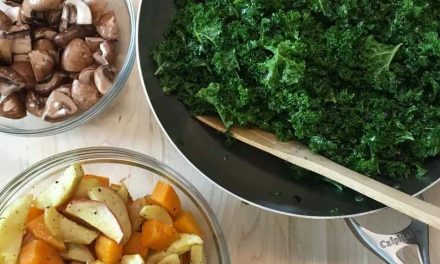 You can make veggie or pasta bakes, roast potatoes and bake small puddings. Suitable for conventional ovens. Not dishwasher safe. Handwash only. This is a fairly-priced set with three very handy, versatile and everyday cookware items for stovetop and oven use. It needs to be hand washed, but that’s what we expect from cast iron cookware, even enameled sets. It’s great for you if you need a few extras to add to your set which you don’t already have (i.e. a griddle and a gratin dish). Here we have another enameled cast iron cookware set, but this one is very comprehensive with 8 pieces (not including lids). You’ve got everything you need for all kinds of stovetop cooking such as boiling pasta, making soup, searing meats or simmering stews. You’ve also got oven cookware for dishes such as veggie and pasta bakes, puddings, slow-cooking casseroles and many more. The enameled coating is great for you if you just can’t be dealing with seasoning your cookware. You can use this cookware on all cooktops including glass and ceramic. We like that the saucepans have pouring spouts built into the rims so you can pour that sauce or gravy without sloshing it everywhere. The cast iron creates that fast and thorough heat conduction and keeps the heat locked in. The enameled surface means you don’t need to season it at all, and it provides somewhat of a non-stick performance. Traditional styling; Make a statement with stylish pans, dishes and lids. This is a really thorough set which could easily replace an existing old set, or completely stock a brand new kitchen with everything you need for everyday cooking. There are three color choices (cream, red or orange) so you can get a little brightness if you’d like. Great for you if you want the benefits of cast iron but you don’t want the added task of seasoning, and you’d prefer a colored designed as opposed to rustic and raw. This set is all about the casserole. You get four different casserole dishes: 2 round ones 2.7 and 4.7 liters, an oval one 6.2 liters, and a shallow one 3.9 liters. Each one is fitted with a tight, secure lid with a tall stainless steel knob making for easy lift-off. We like that each one has two opposing side handles making for strong, secure and safe handling to and from storage, stove and oven. The color is a great feature of this set (speaking specifically about the red one) as it’s a graduated red with bold saturation. It’s a great way to add color to your kitchen without going down the tacky plastic route. These casserole dishes are suitable for all cooktops including induction, and they are oven-safe up to 500 degrees Fahrenheit (exactly what a casserole dish needs). You could really make anything in these dishes; boil pasta, simmer curries, make soups, bake bread, bake one-dish chicken and veggie recipes…almost anything. Contains: 20cm / 2.7L & 24cm / 4.7L round casseroles, 30cm / 6.2L oval casserole and 28cm / 3.9L shallow casserole. Available in other sizes, colours and sets, search for ProCook cast iron for the rest of the range and offers! This is the perfect set for anyone who switches between stove and oven regularly, with a penchant for slow-cooked casseroles and stews. Make sure you’ve got ample storage room for this set, as they will take up a fair amount of space. Ideal if you’ve got an induction cooktop, and if you’d prefer a set which doesn’t require seasoning. This is another set from Cooks Professional, this time we’re looking at a 5-piece set (not including lids). We love how you get two different cookware surface finishes: enameled cast iron and non-enameled cast iron. The frying pan and griddle have cast iron cooking surfaces, so you’ll need to season them to keep that fantastic non-stick surface. The roasting dish and two casserole dishes are both enameled on the interior and exterior, meaning you don’t need to season them. The color choices are between gray and cream, we think the gray is the best choice as it has an elegant, inky appeal to it. The griddle and frying pan has holes in the ends of the handles which means you can hang them on hooks for easy storage and a bit of aesthetic appeal. Speaking of handles, the casserole dishes both have opposing handles on the sides so you can get a strong, two-hand grip when taking the dishes in and out of the oven. This is important for handling hot, heavy dishes. Use it in your oven, on gas, induction, ceramic, electric and halogen cooker tops. The cast iron distributes heat evenly to cook food perfectly. From casseroles to grills you can create a variety of culinary delights. The cast iron cookware set includes: a medium (21cm) and large (26cm) casserole dish with stainless steel top handle, a roasting dish (23cm), a frying pan (25cm) and a griddle (24cm). Please note: The cast iron cookware set is not suitable for use in microwaves. 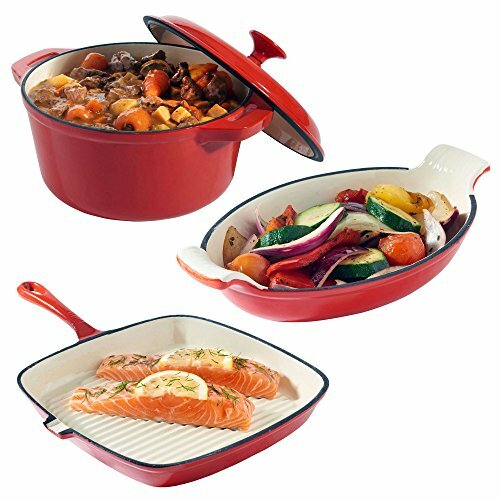 We love this set for the oven-friendliness, cool colors and great heat performance thanks to the cast iron. It would be a great set for anyone who needs a small new set but they’ve already got saucepans at home. It would make for a fabulous gift for a new homeowner too. The cost isn’t small, but it’s very fair considering what you get and the quality of materials and design. Cast iron is a fantastic choice for a new cookware set. If you value great heat retention, even heat distribution, durability, decent weight, great colors and high heat tolerance, cast iron is a better choice than other materials. There are a few things to consider when it comes to maintenance: do you want to avoid the seasoning process or does it not bother you? Does hand-washing fit into your routine and lifestyle? What kind of cooktop do you have? Luckily, most of these sets are compatible for all cooktops including induction. In terms of seasoning, if you’d prefer not to do that step, you’d be best suited to choosing an enameled set. Enameled sets are reasonably non-stick and offer bold colors. You’ll have to let go of your dishwasher as your primary washing method for your cast iron pots and pans. Cast iron requires a quick hand wash (for enameled cookware) or a simple wipe down (non-enameled) and a thorough drying. The sets we have reviewed here today are all worth your money in terms of materials and durability. Your job is to figure out which specific items you need to add to your collection, what your budget reaches to, and pick the set which fits the bill. The Le Creuset set is for a higher budget with a need for a large, comprehensive set. The Klarstein set is specifically ideal for keen campers and outdoor cooks with a medium budget. The VonShef set is great for adding a few extras you may be missing from your core set, with a medium budget. The Cooks Professional 8-piece set is for higher budgets and an empty kitchen which needs everything. The ProCook 4-piece set is perfect if you really need a good collection of oven-safe covered casserole dishes but you’re all set for everything else. The Cooks Professional 5-piece set suits medium-high budgets and a preference for an enameled cookware starter set. Are cast iron skillets oven safe? Yes, they absolutely are. Cast iron has been forged in very high heat and is basically indestructible. Being oven safe is one of the best features of cast iron cookware. You can start the process off on the stove, (to brown meat, for example) then finish it off in the oven at high heat. Can cast iron cookware be used on glass top stoves? Yes…but be careful. Cast iron cookware is very heavy and often a little coarse on the bottom exterior surface. Be very careful when using a cast iron skillet or pan on a glass stove top and be sure not to drag or drop onto the surface. Cast iron is heat compatible with all cooktops including induction, but it just comes down to being gentle with delicate surfaces. Are cast iron skillets dishwasher safe? Definitely not. Cast iron should not be washed with harsh detergents or hard brushes either, as these can strip away the seasoned surface. It should be wiped with a paper towel or cloth, thoroughly dried and stored. The dishwasher will cause your cast iron to rust and the seasoning will be stripped away. When your cast iron cookware becomes too grubby you can start the whole seasoning process again, starting with a good scrub and a proper seasoning with oil, heat and drying. Why do cast iron skillets rust? Cast iron skillets and other cast iron items rust when they’re not seasoned and they’re exposed to moisture. 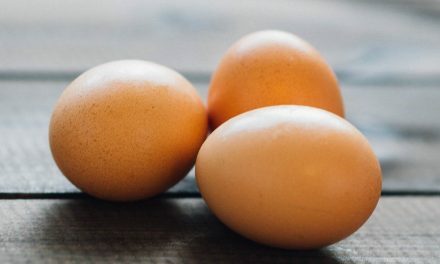 By seasoning them (adding a layer of oil and heating) you are protecting the cast iron surface from being exposed to moisture and air, which cause rust. If you choose an enameled cast iron cookware, you won’t have to worry about rust as the iron is coated and protected from the elements. You can bring old, rusted cast iron skillets back to glory with a few simple steps, so it’s not the end of the world if your cast iron cookware does happen to get a wee bit rusty. Is enameled cast iron cookware safe? Yes, as long as the glaze is lead or cadmium free, or has been tested and approved as being safe enough for sale. Low-quality, cheap enamel coatings might be more likely to chip or scratch, which can allow the metal to leach. However, there is some interesting research out there regarding the benefits of iron (as in iron from cookware!) for people with iron deficiencies. While it seems odd, it’s worth checking out if it interests you or is relevant to you. Choose a high-quality enameled cast iron cookware set (like the ones we’ve reviewed here) and you’ll be perfectly safe.